Many of these wastes are considered hazardous waste by the US Environmental Protection Agency and require special handling. These materials may not be poured down the drain. Oily rags must be placed in a red oily rag can such as the one pictured here. The rags are emptied out each night by the custodial staff. Do not leave oily rags lying around the floor. Linseed oil, in particular, can ignite on its own if left out, causing fire that may spread to other areas. The oily rag can is self-closing to prevent such an occurrence. Solvents, such as paint thinner, turpentine, toluene, xylene, and alcohols are considered hazardous waste. DO NOT DUMP them down the drain. Follow the instructions for handling hazardous waste. Oil-based paints are considered hazardous waste. DO NOT DUMP oil-based paint down the drain or place in regular trash. 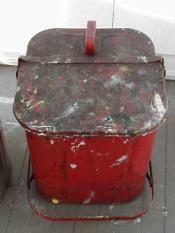 Oil-based paints may be combined with solvents and linseed oil for disposal. Follow the instructions for handling hazardous wastes. Latex paints should be dried out and placed in regular trash. Water-based paints may be disposed via the regular trash. Baby oil is not considered hazardous waste. Baby oil can be used to clean brushes and can be washed down the drain. Excess baby oil can be disposed in the regular trash. Because of its potential for fire, linseed oil should be handled as a hazardous waste, in a similar manner as solvents. Linseed oil can be combined with oil-based paints and solvents for disposal. Follow the instructions for handling hazardous waste. Many ceramic glazes contain metals that are considered hazardous waste. Unused portions of the glazes should be disposed as hazardous waste. Glaze preparation and rinsing should be conducted in a sink specified for this purpose. This sink should be equipped with a settling tank to prevent the solids from entering the drain. At least monthly, the settling tank must be opened and emptied. The collected material must be handled as hazardous waste. See the instructions at the end of this section. Photographic chemicals generally fit into four categories: fixers, developers, rinses, and specialized chemicals. Standard developers and rinses can be rinsed down the drain during processing. Most fixers contain silver in quantities above the amount allowed for sewer disposal. Fixer wastes must be collected and either poured through the silver recovery unit on the first floor photo area or collected as hazardous waste. Specialized chemicals, such as special acids and bases, should be assumed to be hazardous waste and collected accordingly. Materials with a pH of less than 2 or more than 12.5 are considered hazardous waste. Do not mix these wastes with the solvent or oil wastes. Use care when handling acids and bases and follow the instructions for handling hazardous waste. Oils such as pump oil, motor oil and other machine oils are recyclable. These materials should be placed in a plastic container, sealed and labeled as Used Oil. Do not label them as hazardous waste or as waste oil. The used oil should be disposed via the monthly waste pickup. Sharp objects, such as razor blades, knives, and broken glass should be packaged in a puncture-proof jar or box and placed in the regular trash. Pre-packaging helps to avoid injury to janitors or others handling the trash. Empty chemical containers should be triple-rinsed and recycled or placed in regular trash. Materials that are to be disposed of as hazardous waste must be placed in sealable containers. Containers should be filled, leaving a headspace for expansion of the contents. Often the original container is perfectly acceptable. If you routinely generate significant quantities of compatible solvents, bulking of waste in five-gallon carboys provided by EHS may be practical. Similar wastes may be mixed if they are compatible (e.g solvents, linseed oil and oil-based paint). Containers must be kept closed except during actual transfers. Do not leave a hazardous waste container with a funnel in it. Waste containers must be labeled as hazardous waste as soon as the material is first put into the container. Place the waste materials in an appropriate waste container. Seal the container. Do not leave a funnel in an open container. Ensure the container has a completed hazardous waste sticker on it. If there is no room for a sticker, or if a sticker is not immediately available, write the words "Hazardous Waste" on the container and list the material contents. Once the container is full, inform the sculpture shop to ensure that it is included with the next scheduled waste pickup. Complete and submit a waste pickup request form to EHS for pickup. Don�t purchase more of a material than you expect to use in the foreseeable future. The costs of disposal often exceed the purchase cost by a considerable margin. Substitute with a less hazardous material whenever possible. Consistent with safe practice, bulk compatible waste in containers up to five gallons in capacity to reduce disposal costs (consult with EHS first). Keep all chemical containers clearly and unambiguously labeled. If applicable, use a satellite container label. Dispose of your wastes at the completion of a project - don�t abandon them for someone else to deal with later. For more information, see Chemical Waste Disposal.